OK. So maybe I picked the UCONN Huskies to win the NCAA title last year. And yea, I had the Patriots winning last year's Super Bowl, and the Yankees over the Marlins in the 2005 World Series. 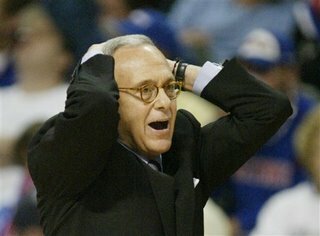 So forgive me when I gloat about the rumored buy out of Larry Brown's contract with the NY Knicks. After a season full of losses, infighting amongst players, coaches and management, and more losses, it looks like Brown's "dream job" may be over. Good riddance I say. There are those out there that will say LB has never turned a team around in just one season and that he needs more time to get his players and philosophies in place, but I said from the beginning he wouldn't be able to do that, and that's why this setup would never work. As long as Isiah is doing his best to run the storied franchise into the ground, Larry will never be able to turn them into a winner, and I think everyone has come to this realization. I hope he gets bought out, it would be sweet revenge for all those teams that Brown just walked out on. Larry has always been the guy that likes to give the impression he is the ultimate team guy, when in reality there is only evidence to show that he is in it all for himself. 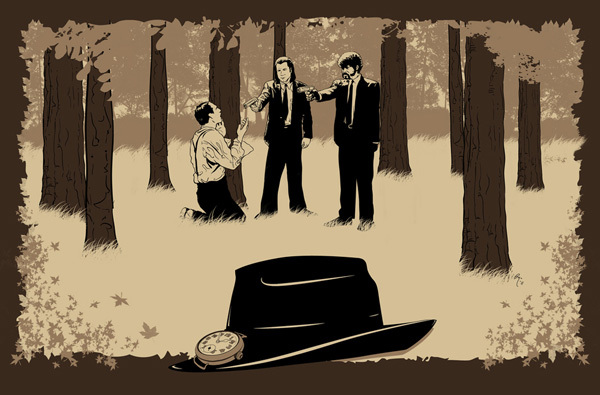 Is he a great tactitioner? Yea. But does that alone make a great coach? No way. It doesn't bother me that he's going to get all this money (possibly the full $40 million remaining) while sitting at home, we just better not see him again. Leave now Larry. Get out of basketball. It may be time he comes to the realization that his style may not work anymore, or that he may just be too stubborn to adapt to new players. Whatever it is, I'm glad it's all blowing up in his face, and I sincerely hope this is the last time we see him on an NBA bench. As for Isiah taking over as coach? (laughing) Zeke has already destroyed the CBA and the Raptors, and he is well on his way to totally killing the Knicks. I don't see how you make him the head coach, but then again, I don't see how you make him GM either after the previous failures he'd experienced. For the sake of their fans, I hope the Knicks can figure something out, but the future looks bleak at best. *This week was a wash, both literally and figuratively. After taking 2 of 3 from the Yanks to start the week, the Sox only got in one game with the Rangers, a 6-0 loss in 6 innings. But winning the 3 game set in the Bronx was a good sign. Although I still think these two teams will remain close the whole year, anytime the Sox can make Steinbrenner blast A-Rod, I consider it a job well done. *It's great to see Ken Griffey Jr. back in action. I mean with all the negative stories surrounding Barry Bonds chase for the home run record, we sometimes forget that if not for some terrible injuries, we would all probably be watching Junior chase down Hank and the Babe. But due to injuries, Junior is no longer the Gold Glover he once was, and he hasn't played more than 130 games in a season since 2000, his first year in the Natty. I can't help but think, that if Ken had chosen to take steroids, would he have been able to recover faster or come back stronger? *Don't look now Met fans, but after winning 9 of their last 10, the Phillies are right on your heels. And this has all come without any production from star slugger Bobby Abreu, who's hitting a measly .257 with only 13 extra base hits in 108 at-bats. Chase Utley, Ryan Howard, Pat Burrel and Aaron Rowand have picked up the slack offensively, while starters like Gavin Floyd, Jon Leiber and Brett Myers have provided enough to get to Tom Gordon, who has a 1.62 ERA and is averaging 14 K's per nine innings to go along with 12 saves. It also doesn't hurt that lefty specialist Rheal Cormier has yet to give up an earned run in over 11 innings this year. I still have the Mets winning this division, but with the Braves and Marlins having down years, it's good to see their should be a fight to finally dethrone Atlanta as NL East champs. *I would be remiss if I didn't touch on the piece of work Rick Sutcliffe produced this week while attending a Padres game. After tossing back a few too many tall boys, Sut somehow stumbled into radio booth and onto the air. Once there, he started to bumble about how his daughter is going to Harvard, George Clooney saving the people of Africa, his golf trips will Bill Murray and the fact that he has very little to do these days for his employer, ESPN. It was the best drunken rambling since Broadway Joe offered to kiss Suzy Kolber a few years ago. I think it's safe to say Sutcliffe must have a smart wife, because there's no way his genes are what got his daughter into Harvard medical school. If you want to view the video of the incident, just go to www.deadspin.com and take a look, its truly hilarious. 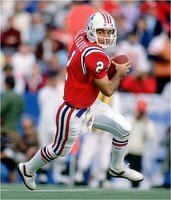 Doug Flutie called it a career today at the age of 43, after seasons 21 in professional f ootball. Flutie rose to stardom with his Hail Mary pass to push Boston College past Miami in that memorable Thanksgiving game to go along with his Heisman trophy in 1984. Doug spent 12 season in the NFL, but was a much more effective player in the CFL where he won 6 MVP awards and 3 Grey Cup Championships. Doug's style was always fun to watch, darting around the field, a small boy in a game of huge men. He looked out of place, but he was always able to make some magic happen, not to mention how elusive he was in video games. I'm glad Doug was able to return to New England to finish his career, and the drop kick he pulled off this year was one of the more exciting plays in recent memory. I'm also glad Doug is going to be working for ESPN/ABC. He has such a passion for the game that just beams out of him, and the game needs more people like that as opposed to blowhards like Tom Jackson and Shannon Sharpe. 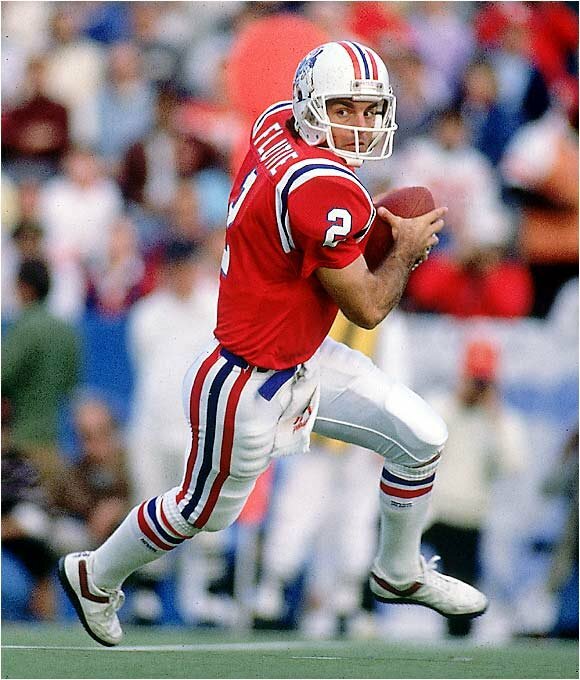 So while it will be sad to see Flutie go, it's good to know he's not going too far. *Congrats to Uncle Spliff Robinson. The Nets forward was suspended for for violation of the NBA's substance abuse policy. I thought the Nets were going to win this series before the playoffs began, and not like this suspension is the reasons they won't, but it certainly doesn't help. Note to Cliff: You had the whole summer to spark up my man, there was no need to burn one down in the middle of a playoff run. Too bad now nobody will remember the great years you had in the NBA, only the fact you got suspended for hittin' the hookah when your team was in a 2nd round playoff series. Even Rick Sutcliffe thinks your an idiot. *San Jose Shark fans for booed the Canadian anthem before their game against the Edmonton Oilers? I mean I am all in favor of showing support for your team, and even hating on the opposing team, but this is just idiocy. Yea sure the Oilers are from Edmonton, and thats in Canada, doesn't change the fact that 15 San Jose players, including MVP candidate Joe Thornton, are also from Canada. Gee. Maybe that vibe was part of the reason the Sharks dumped game 5 at home, and our now facing elimination on the road in America Jr. It's no wonder every other country hates us. But I'm not sure I'd expect anything less from hockey fans in California. *Well, the week with my pitchers getting bombed and it never got much better. It was one of those times where it seemed no matter who I put in, the guys on my bench did better. But on a positive note, my pitching for the rest of the week was incredible, and hopefully I can carry that momentum and string together a few good weeks to get myself back in the race. And from the "who would have thunk it" category. Hanley Ramirez has been a thorn in my side. I mean how do I bring myself to play him over Miguel Tejada or Todd Helton? Well he's been making a great case, batting .336 with 10 doubles and 8 SB, including this past week in which he batted .462, better than Helton and Tejada combined. Geesh.